PRANK RECORDS: AVSKUM Final GIG JUNE 27th-28th, ALAFORS , SWEDEN @ PUNK ILLEGAL. 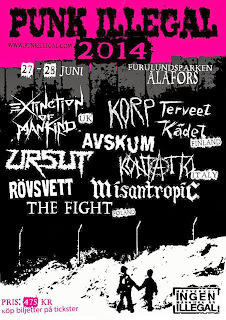 AVSKUM Final GIG JUNE 27th-28th, ALAFORS , SWEDEN @ PUNK ILLEGAL. AVSKUM have announced their final gig to be held @ PUNK ILLEGAL JUNE 27th-28th, 201 in Alafors, Sweden, north of Gothenburg.